The Seiko SNK807 is a military style field watch that can be dressed down or dressed up. It uses the 7S26 movement of Seiko which has proven to work for years. It is an affordable watch that is reliable and made with the highest quality materials and one of the best automatic field watches in the market. The Seiko SNK807 can work for years, if not decades if used and treated right. In 1881, Seiko was founded in Tokyo, Japan. It started as a jewelry shop and in 1892 they started making and selling clocks. In 1917, Seiko became a corporation and they started releasing watches for men and women. Seiko is a Japanese term for “exquisite” or “success”. In 1969, they released Astron, which is known as the world’s first quartz watch. Today, they are known for producing high-quality wristwatches. 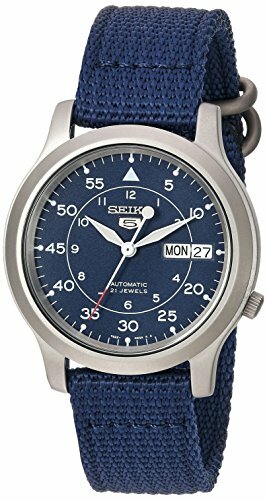 The Seiko SNK807 is an automatic strap watch with blue canvas and it is a cutting-edge wristwatch with an appeal of masculinity. It features a blue analog dial and a blue canvas band, it is known for its style and it is an incredible addition to your watch collection. This automatic mechanical watch does not operate on batteries, it is actually powered by the movement of whoever wears it. In order to maintain the accuracy of the watch, it should be work for at least 8 hours per day or it should be manually winded by turning the crown of the watch. If it is not in use, it can be kept charged by using an automatic watch winder which can be purchased separately. The Seiko SNK807 is one of the best entry-level automatic watches for those who are looking for a wristwatch to use or collect. The key features are satisfying, and the quality of the watch is reliable. It is also durable, and it is practical especially for beginners. This wristwatch is the best option for those who are looking for a high-quality automatic wristwatch. It is also perfect for those who are looking for a men’s watch that they can give as a gift or that they can purchase to use every day. It has beautiful aesthetics, it has an incredible functionality and it has a price that is understandable for entry-level watches. It is loaded with amazing features and it can be used in the dark and in the water. The SNK807 model of Seiko has an amazing set out dial with an uncluttered finish that is fair and easy to read. The hands of the watch have an incredible coating to make it luminous that can make them easier to see and read in the dark or dim lit conditions. The casing of the watch is made out of strong stainless steel and it has an exhibition glass caseback that can let you see the movement of the hands of the watch. The SNK807 model of Seiko has a Hardlex crystal glass, and it is what Seiko watches are known for. They offer a great level of knock and scratch protection that is in the middle of the range between sapphire glass and mineral. What powers the wristwatch is the workhorse movement which is popular in Seiko watches. It is a 7S26 automatic. It has a 43-hour power reserve and a 21-jewel movement that runs at 21,600 BPH and it gives it a really smooth and steady 6 ticks per second sound and finish. The Seiko SNK807 is a part of the SNK series and it has a smaller profile then the other watches that are not a part of the SNK series. The diameter measurement of the casing is about 37mm and it does not include the crown and it has a thickness of about 11 mm. It makes it a medium size, to at least a small one that would fit people who have smaller wrists. The strap of this wristwatch is made of strong and very sturdy blue canvas material. It measures at around 18mm and it goes well with the size of the casing. It has a buckle style clasp that fastens immediately. The strap of this watch can be replaced if you want to. Although there are critics of the blue canvas strap as it looks like a children’s watch with it on, it is still durable and usable. You have the option to change the strap and choose a color that you want. One of the best features of the Seiko SNK807 watch is the exhibition caseback that allows users to look at the inner materials and workings of the wristwatch through the glass caseback of the wristwatch. It si beautiful and fascinating at the same time. This wristwatch is not designed for water wear thus making it have the basic rating for water resistance. It has a 30m or at least a 3-bar rating that makes it suitable for daily use. It is rain and splash resistant, but it can’t be used for swimming, showering, snorkeling, fishing and other water related activities. The Seiko SNK807 has its own Calibre 7S26C which is a movement that is found in many Seiko wristwatches. It can help preserve power to at least 40 hours. Although there were a lot of concessions in the movement of the watches before because of the 7S26C process, the company has improved the caliber over the past years. The 7S26A was once known for losing 30 seconds per day in its time accuracy, the 7S26C was able to reduce it to at least 3 to 5 seconds a day which is reasonable. It does not mean that there are no concessions anymore as the 7S26C does not support winding of the watch manually and it also does not have hacking seconds. Either way, they were able to improve the movement with the 7S26C process. 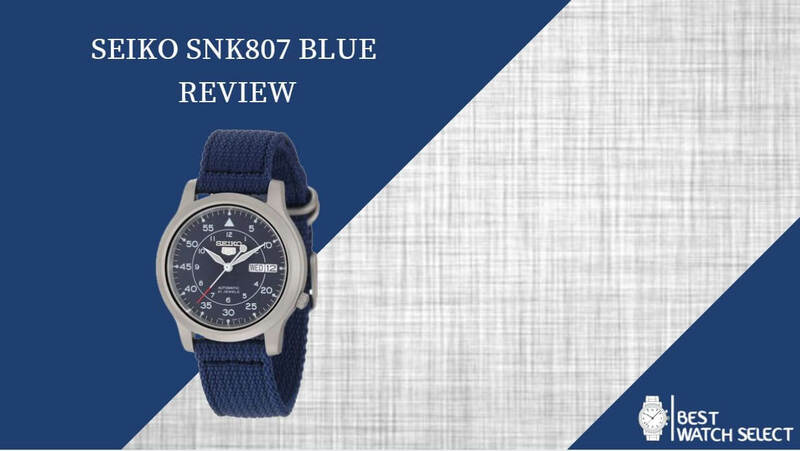 Seiko SNK807 has an astonishing four out of five stars overall review from its customers. Most customers have stated that the wristwatch is perfect to use anytime and anywhere. Also perfect to use on a daily basis. It is also perfect for casual and professional occasions as the style suits both. It can also be used in dark or dim places because of its luminous hands. The ticking is also smooth and soft and it is not as loud as the other wristwatches that you can see in the market. There are instances wherein the functionality is the problem especially if it is not used regularly. The date or the time could be inaccurate thus it needs to be adjusted regularly. Also, if not handled with care, it could not last long. The strap is also not of the highest quality, even though it is durable as it could be stretch and it could be worn, after a few months of using it constantly, you will see the edges slowly peeling off. The Seiko SNK807 offers English and Spanish. You can switch them up and use the language that is comfortable for you. This watch is rain and splash proof, but it is not suitable for water activities such as diving, swimming, showering, fishing and more. What is the strap size of the watch? This Seiko watch requires 18mm straps. In fact, you’ll likely want to use a better watch strap with this unit. The canvas strap is a good one, but it’s not the best option in terms of durability and water-resistance. Is the Hardlex crystal durable? Hardlex crystals are durable but they are not as durable as the sapphire crystal. It is an entry-level watch thus it is not much of an issue as it is perfect for beginners. What comes with the watch? Once you purchase the Seiko SNK807 watch, you will receive a manual and a warranty card. The manual will give you the instructions needed so it should be read carefully. The warranty card should also be filled out immediately. The terms and conditions are also attached to the warranty, so everything will be written down especially about what it does and does not cover. Yes, the blue canvas strap is replaceable. There are also other colors available for you to choose from. How long can it keep the time and the date when it is not worn? This watch is automatic and not battery-powered, and the key issue is not being able to keep the time and the date. It has a reserve power that could last for 40 hours and it keeps the watch ticking. It can still work even though it is not worn for a day or two. The watch is not battery operated as it is powered by your arm movement. You can purchase a watch winder as it allows you to charge the watch. It is an incredible accessory to add. The Seiko watch company has achieved a new high with their incredible SNK807 model watch. They were able to make an affordable automatic watch with incredible features. They also added the day and date feature beautifully despite the true price. There are functionality issues that unavoidable, but Seiko was able to make them inapparent. This watch may not be perfect, but it is incredible considering the price. The Seiko SNK807 makes a great accessory no matter what the occasion is, whether it be formal or informal. It is also perfect for someone who has not tried a mechanical watch before. You can also throw out the blue strap and replace it with something that you prefer. The Seiko SNK807 has a beautiful dial and it is a well-executed exercise. It does not have any element that is distracting, and the company did a great job on making it legible and clean. It has a minute marker and an inner track that displays the background and it is slightly textured. It also has Arabic numerals with at least five-minute intervals which is similar to the inner hour track which as Arabic numerals at every single hour. It also has small illuminated pips at the outer edge of its dial thus making it sufficient. At the three o’clock position you will see the day and time window while at the twelve o’clock position you will see the Seiko logo. They are all executed amazingly well, and it suits the watch. It adds an incredible touch at the disc that has two languages, English and Spanish. It has beautiful sword hands for the minutes and hours. The second hand is a straight pin and its end is tipped in the color red which adds color to the watch.